one you love don't forget to check out their other stuff, too. the most popular vegan cooking blogs around. to punch you full in the tastebuds. tastebuds happy and your body energised. simple, tasty dishes made with easy-to-find ingredients. perfect for kids and family. you ate them more often - this is the book for you. Southern, African and Carribean favourites. full of tasty recipes inspired by the author's travels around the globe. to go if you're looking to impress. Like to host dinner parties? Then you've found your cooking bible. 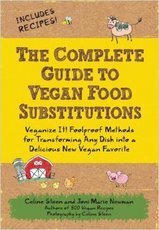 ​ instructions on how to replace it with a cruelty-free alternative. No pictures here, but there's a whole host of simple and tasty recipes. A extensive selection of recipes with something for all occasions. children’s parties, and holiday feasts, all your needs are covered. delicious, healthy pizza at home without any meat or dairy products. stir-fries, noodles, pasta and salads. including your own homemade tortillas, salsas, and condiments. ​ inspired by regional cuisines, Indian culture, and local foods. there's everything you'll need to be plant powered on the go. Lauren Toyota of Hot for Food. for creative, substitution-free treats both savory and sweet. ​ explodes with flavor, color and texture to delight and nourish everyone. scratch whatever your skill level in the kitchen. ​ outstanding example of the possibilities of plant-based cooking. and nourishment, featuring compelling and delicious recipes in one dish. ​ delicious recipes inspired by the most popular cuisine in the world. life-giving, glow-worthy foods with flavor and depth that feeds the soul. plant-based recipes to fuel your workouts - and the rest of your life. whatever food you think you’ll miss by going vegan*) and eat it too. VBQ is smoky, succulent, and completely plant-based barbecued fare. classics, plenty of sides and sauces, plus lots of new global offerings. snacks and desserts that put them to use. hoarded gold, it would be a merrier world"